This comes as no surprise to those acquainted with the campus, but SFSU students lead busy lives reports U.S. News and World Report in its "America's Best Colleges" issue which hits newsstands today. 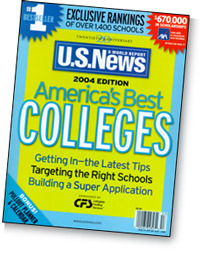 SFSU was selected to be featured for the U.S. News college issue because it represents the prototypical "commuter school." Universities that represent other college experiences -- from liberal arts schools to military academies -- are also profiled. The article explores the lives of several commuting students, all of whom juggle various responsibilities -- from parenthood to working several jobs -- alongside their schoolwork. These students do not fit the stereotype of a 19-year-old living in a dorm, but they do value their college experience -- and, as the article points out, perhaps value it even more, as it will help them provide a better life for themselves and their families. "I'm not here to fool around," freshman Tara Binsaree told U.S. News. "I can't understand why people would go to college to party and drink." Josh Scott a 23-year-old English major, agrees. "I've learned more about life than you would by just rolling out of bed and going to class," he said. In the rankings, SFSU placed in the second tier of western region master's degree schools -- scoring the highest academic reputation score in its tier. The University also ranked 10th in its category in campus diversity and 8th in the number of transfer students.